The Internet constitutes an enormous electronic architecture that defines spaces without regard to physical structure. We navigate these spaces with browsers, moving from place to place with a click on a link. Internaut proposes that a physical architecture may be derived from the shape of the network and navigated with a first-person 3D game engine. 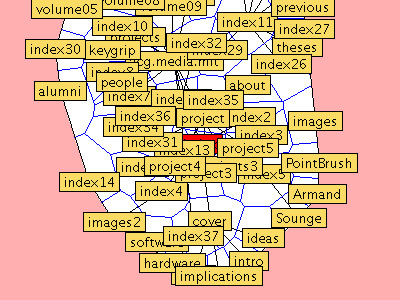 The applet represented here demonstrates the process of turning a network structure into a physical map. 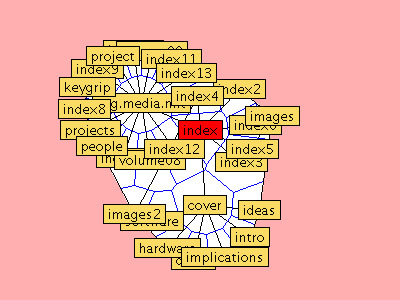 The nodes are pages connected by links. The links act as springs, drawing the graph into its lowest energy state, a configuration best suited to physical navigation. The cells themselves are generated as a Voronoi diagram, bounded by a convex hull around the set of sites.